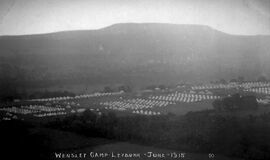 As we discovered in the previous chapter the Lonsdales had left the familiar grounds of Blackhall Camp to continue their training at various other camps, leaving the border counties of Cumberland and Westmorland. 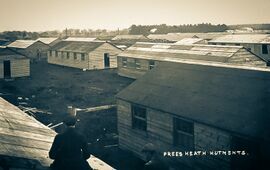 The Prees Heath Camp in Salop (present-day Shropshire) was their first move. It was here that they formed part of the 97th Brigade along with the 15th, 16th and 17th Battalions of the Highland Light Infantry. After a short stay at Wensleydale in Yorkshire they were stationed at Salisbury Plain for a few weeks in the autumn until orders were received to prepare to move out and proceed to France. On the 23 November 1915, the Lonsdales entrained at Codford for the port of Folkstone where, at 1am, they sailed on board the steamer Princess Victoria with the rest of the 97th Brigade, at that time under the command of Brigadier-General Jardine. The months they had spent in training at home had come to an end and the eight hour journey from Folkstone, at least for some men, was most likely spent in reflection of what awaited them when they finally reached their new port, Boulogne. It was their second day in France and preparations would need to be made but it wasn’t long, in fact only one day at Gorenflos, before they marched again, this time to Picquigny on the 27 November and Villers-Bocage the following day. The men were not kept idle as during their brief stay there they were involved in close order drills, route marches and inspections, something, at least, they were not unfamiliar with having spent many hours and days fine-tuning these very things back home. On the 2 December the Lonsdales continued across countryside to Molliens-au-Bois involved in much the same as before, however, with the wet weather that had befallen them, instead of gruelling route marches the men were involved in physical drills, lectures and more inspections. Their Commanding Officer, Lt-Col. P. W. Machell, ran a tight ship, which is why it is does not come as a surprise that in March of that year his Battalion was considered "far ahead of other service battalions" when it was inspected at Blackhall Camp by the War Office. The discipline of the men did not go unnoticed. The men were turning heads in the upper echelons of the Brigade and their previous training was the perfect way to stand them in good stead for the coming months. The Lonsdales remained at Molliens-au-Bois for ten days where it was "settled that we go for practical training, attached to old units" in the use of live hand grenades, under the inspection of Lieut. Kemp of the Manchester Regiment. Each platoon of 8 men was carefully instructed in the usefulness of its destructive powers if used correctly, but also of its potential dangers and devastating effects if used incorrectly. Then, on the 12 December 1915, the Battalion, including headquarters and transport, proceeded to camp at Bouzincourt twelve miles east, close to the small town of Albert, a key location in the Battle of the Somme where "nearly all British troops marched through on their way to the front." The surrounding area had a huge network of trench systems that had been dug into the landscape and aptly named by the troops such as Crucifix Corner and Oban Avenue. This network of chalky, muddy paths roughly two metres deep, and others just like them, became the Lonsdales home for several months and comfort was not at the forefront of their design. Machell’s positive outlook on situations, that to most would seem bleak and despairing, was a credit to his natural ability as a strong, yet sympathetic leader. His men had looked up to him during their formative months of training and continued to do even when circumstances were less desirable. He gave the men direction and a sense of purpose. There would have been men without understanding for what it was they were fighting for, but to fight for their commanding officer was something, at least, the majority would do resolutely. The men had been educated on what to expect and this was something they had to get used to as by mid-1916 it was going to get a lot worse. Their arrival in France did more good for the men than they may, at first, have known. They were honing their skills, learning the way of trench life - as unpleasant as it could be – and garnering instruction on the effective use of their everyday tools that would, ultimately, keep them alive. The year was coming to a close and on the 15 December, Capt. L.B. Hogarth, having recovered from his sickness at Boulogne, was now attached for duty in Commanding the Royal Engineers of the 51st Division. For a few days the Lonsdales had been at the front, the Companies separated and attached to other battalions. Lt-Col. Machell went out daily to visit each Company in the line and noted that "they certainly are behaving extremely well." But on a personal level, knowing that officers had relative comforts and where possible were supplied with the best billets and dugouts available to them, he could only sympathise for the conditions in which his men had to endure, stating: "I feel very bad about the men, and one can't do enough for them." These are the words of a selfless man who clearly cared for the wellbeing of his men, working tirelessly to ensure what little comforts he could afford them were made available or, at the very least, visit them as often as he could. In general terms the fact remained that comforts were more often than not bestowed upon men of rank and well-to-do backgrounds, which seemed somewhat unfair when compared to what the common soldier was allocated. Whilst Lt-Col. Machell's family history would suggest a certain privileged upbringing, a lineage dating back to the 5th century CE and marriage to Countess Victoria Alice Leopoldine Ada Laura Gleichen, daughter of Prince Victor of Hohenlohe-Langenburg, who himself was Queen Victoria's (half) nephew, might conclude Machell was a man given to a particular affluent lifestyle, yet he was a military man that had spent many years away from the comforts of his home, instead choosing a regimented career in Egypt over a socialite one in England. He had an understanding of the war machine, using that understanding to great effect and, ultimately, wanting to see his men pull through the war they now very much a part of. 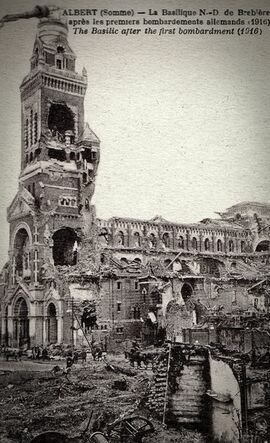 By this point in time the war was in its 16th month and those that though it would be over by Christmas 1914 were sorely mistaken. A year on and attrition had caused little development in the conclusion of a war that would continue to wage on for almost another three years. Much to the relief of the men, within three days the 17th Highland Light Infantry took over their positions and the Lonsdales moved back to camp at Bouzincourt, out of the perpetual mud and the damp. On Christmas Eve, one officer and 50 other ranks were involved in supplying fatigues for the Royal Engineers in erecting hutments, whilst on Christmas Day, the Lonsdales held a church parade, then A Company moved to Aveluy where they billeted and supplied guards and further fatigues for 97th Brigade Headquarters. On the 31 December, all four Companies of the Lonsdale Battalion were now situated at Aveluy. One man was involved in a court of inquiry for a self-inflicted wound to his foot, the finding of which was deemed accidental and here ended the Lonsdales first five weeks in France. The year 1915 may have come to a close but the Lonsdales journey would continue. 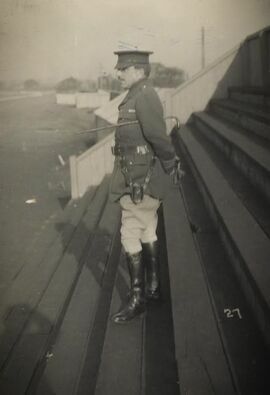 ↑ 1.0 1.1 1.2 Colonel H.C. Wylly, C.B. 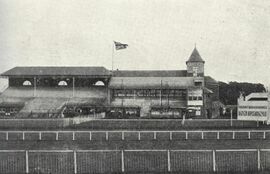 (1925). The Border Regiment in the Great War. Gale & Polden Ltd. ISBN 1847342728. p.71. ↑ In the Battalion war diary it states 23 officers and 896 other ranks, a substantial discrepancy between the two sources. ↑ 3.0 3.1 3.2 3.3 3.4 11th Battalion War Diary, November to December 1915. ↑ 4.0 4.1 4.2 4.3 4.4 4.5 4.6 4.7 4.8 4.9 Record of the XIth (Service) Battalion (Lonsdale) - In France, 25 November. ↑ The inspector of Recruiting from the War Office, the Muskerty Staff Officer from Headquarters (Western Command), and a Staff Officer for Physical Drill (Inspector of Gymnasia). ↑ 6.0 6.1 6.2 Colin Bardgett (1993). The Lonsdale Battalion 1914-1918. G. C. Book Publishers Ltd. ISBN 1872350607. p.13. ↑ Colin Bardgett (1993). The Lonsdale Battalion 1914-1918. G. C. Book Publishers Ltd. ISBN 1872350607. p.14. ↑ Countess Victoria Alice Leopoldine Ada Laura Gleichen The Peerage. Accessed 12 August 2016. ↑ Prince Victor of Hohenlohe-Langenburgone Wikipedia, the free encyclopaedia. Accessed 12 August 2016. This page was last edited on 21 April 2017, at 15:37.